Pope Francis Compares Catholic Radicals Thomas Merton & Dorothy Day to Lincoln and MLK | Democracy Now! During his speech before Congress, Pope Francis highlighted the work of four “great” Americans: Abraham Lincoln, Rev. Martin Luther King Jr., Dorothy Day and Thomas Merton. “A nation can be considered great when it defends liberty, as Lincoln did; when it fosters a culture which enables people to 'dream' of full rights for all their brothers and sisters, as Martin Luther King sought to do; when it strives for justice and the cause of the oppressed, as Dorothy Day did by her tireless work, the fruit of a faith which becomes dialogue and sows peace in the contemplative style of Thomas Merton,” the pope said. We look at the lives of Day and Merton, two radicals who have inspired the Catholic left for decades. We speak to Orbis Books publisher Robert Ellsberg, who has published books by and about Day and Merton. JUAN GONZÁLEZ: During his address to Congress on Thursday, the first ever by a pope, Pope Francis highlighted the work of four Americans. 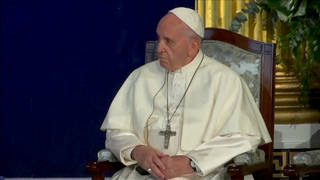 POPE FRANCIS: A nation can be considered great when it defends liberty, as Lincoln did; when it fosters a culture which enables people to “dream” of full rights for all brothers and sisters, as Martin Luther King sought to do; when it strives for justice and the cause of the oppressed, as Dorothy Day did by her tireless work, the fruit of a faith which becomes dialogue and sows peace in the contemplative style of Thomas Merton. AMY GOODMAN: Later in his speech, the pope returned to Dorothy Day, calling her a servant of God. POPE FRANCIS: In these times, when social concerns are so important, I cannot fail to mention the Servant of God Dorothy Day, who founded the Catholic Worker Movement. Her social activism, her passion for justice and for the cause of the oppressed were inspired by the gospel, her faith and the example of the saints. JUAN GONZÁLEZ: The pope went on to talk about another Catholic figure, Thomas Merton. POPE FRANCIS: A century ago, at the beginning of the Great War, which Pope Benedict XV termed a “pointless slaughter,” another notable American was born: the Cistercian monk Thomas Merton. He remains a source of spiritual inspiration and guide for many people. In his autobiography, Merton wrote: “I came into the world. Free by nature, in the image of God, I was nevertheless the prisoner of my own violence and my own selfishness, in the image of the world into which I was born. That world was the picture of Hell, full of men like myself, loving God, and yet hating him; born to love him, living instead in fear of hopeless self-contradictory hungers.” Merton was, above all, a man of prayer, a thinker who challenged the certitudes of his time and opened new horizons for souls and for the church. He was also a man of dialogue, a promoter of peace between peoples and religions. AMY GOODMAN: Robert Ellsberg edited and published the selected writings of Dorothy Day, as well as her diaries and letters, and also published books on Thomas Merton, who the pope was just talking about in this extended clip from this unprecedented speech before Congress. Robert Ellsberg is the editor and publisher of Orbis Books, the American imprint of the Maryknoll order. Martin Luther King, Abraham Lincoln, Dorothy Day and Thomas Merton. We started talking about Dorothy Day yesterday on Democracy Now! with you, Robert. Talk more about the significance of what the pope said. ROBERT ELLSBERG: I think it’s extraordinary that his whole framework for his talk was organized around four extraordinary Americans, two of whom are kind of national icons—King and Abraham Lincoln—and only two Catholics. But the two Catholics he chose would not even be recognized by many Catholics today. Dorothy Day, better known because she has been proposed for canonization, she died in 1980. She was a radical in her youth, underwent a conversion, and then started a movement, the Catholic Worker, to combine her faith with her commitment to social justice, the poor and the pursuit of peace. Thomas Merton was the surprise for me. Just 10 years ago, the American Catholic bishops decided to remove his name from a list of exemplary Catholics to be included in a catechism for young adults, because they felt uncomfortable with him. He was a prophet. He was a man kind of on the margins, who didn’t fit into any kind of prefab Catholic Churchy kind of idea of holiness, although he was a Trappist monk and a priest through most of his life. He also underwent a conversion, entered an austere Trappist monastery, wrote a best-selling autobiography that described his conversion, and then became the most popular, probably, Catholic spiritual writer of his time. And I think it was significant, the connection with the pope, that he would register with this idea of Merton of kind of breaking through boundaries of us and them, good and bad, evil, and, you know, us, our side, the bad side, which Merton felt was a kind of spiritual disease that was the foundation of war. JUAN GONZÁLEZ: Well, Robert, it looks to me, judging from his address, that he was actually speaking to two audiences. On the one hand, he was speaking to the general American public and raising the examples of Lincoln and Martin Luther King. But he was also—had an enormous pulpit for Catholics in America, and he was saying to the Catholics of America, “These are the figures that you should hold up—Dorothy Day and Merton,” and, in essence, sending a message to the hierarchy of the church, as well, because I’m sure that many—most Catholics were listening to his presentation yesterday. ROBERT ELLSBERG: I think that’s exactly right. And I’m sure there were a lot of people in the House there who were scratching their heads at the mention of this Trappist monk and what that was all about. It was interesting the way he used Merton as a figure of dialogue, of somebody who overcomes polarization. And he tied that in with the importance of politicians who take bold and creative actions to overcome ancient enmities, and I think, you know, with a reference there perhaps to the negotiations with Iran, the breakthrough with Cuba. With Dorothy Day also, it was interesting—he started by talking about her concern for the poor and oppressed and the common good, and then he pivoted from that to say that the common good also includes the Earth, and that led him into his reflections on ecology. JUAN GONZÁLEZ: Well, I want to turn to Thomas Merton in his own words, speaking in 1968 just before he died. THOMAS MERTON: That’s a thing of the past now, to be suspicious of other religions and to look always at that which is weakest in other religions and always at what is highest in our own religion, because this double standard in dealing with religions, this has to stop. JUAN GONZÁLEZ: That was Thomas Merton in 1968. ROBERT ELLSBERG: That was a speech he gave in Bangkok. He died within an hour of that speech. It was the only recording of him ever, television recording of him, in his life. AMY GOODMAN: And how did he die? ROBERT ELLSBERG: He was there for a conference on Christian monastics in Thailand, but it was part of a longer pilgrimage to the East to explore his interest in Buddhism. He met with the Dalai Lama. He traveled around. He had another kind of mystical breakthrough in Sri Lanka in the face of enormous statues of the sleeping Buddha. He gave the speech, and then he died—an electrocution after taking a shower. AMY GOODMAN: I mean, these two people, Dorothy Day and Thomas Merton, who had repeatedly gotten arrested, engaged in civil disobedience. He was going to be possibly one of the Catonsville Nine—maybe it would have been 10 then—one of those who were protesting the Vietnam War. And then you have Dorothy Day, who was a convert, who had an abortion. She is on the road to canonization. I wanted to go to a clip of Dorothy Day in 1971. She was interviewed by Christopher—the Christopher Closeup show. Here she describes how and when the Catholic Worker Movement began. DOROTHY DAY: There was a war going on at the time it began, between China and Japan, back in 1933. And it began through the efforts of Peter Maurin, a French peasant, who was a former teacher in the Christian Brothers schools in Paris, who felt a call to come to America and be part of the—really build up a lay apostolate. And he came to me because he read articles that I had written about the social order, and suggested we start The Catholic Worker newspaper. AMY GOODMAN: Dorothy Day also explained how she got involved in peace activism. DOROTHY DAY: We began talking about what makes for peace. And that is the teaching in the gospels—the Beatitudes, the Sermon on the Mount and so on. And to take them literally really meant that you began practicing the works of peace rather than the works of war. The works of war are the exact opposite of the works of peace: feeding the hungry when we are destroying crops, and sheltering the homeless when we are destroying villages and wiping out cities. It’s all the way through, right down the line, the opposite. And Christ proposed, certainly, that the work of the Christian was the works of mercy. AMY GOODMAN: Dorothy Day was asked if humankind will ever learn nonviolence. DOROTHY DAY: Just as we are living in a nuclear age, something—we have grown so tremendously in scientific knowledge, it doesn’t seem too much to say that men can begin to awaken to the fact that they haven’t grown enough spiritually and haven’t recognized their spiritual capacities. And I think that today there is, certainly, the beginnings of a movement of nonviolence all over the world—of course, the teachings of Gandhi in India. AMY GOODMAN: That’s Dorothy Day. Robert Ellsberg, you have edited her books, diaries, letters. If you could talk about that, but also correct something I said about Thomas Merton engaging in nonviolence—in civil disobedience? ROBERT ELLSBERG: He was very outspoken in his—in opposing the Vietnam War. He also supported Dorothy Day earlier in her protests against compulsory civil defense drills. But he was uncomfortable with draft card actions that he thought were provocative and kind of raised the temperature and possibly interfered with the possibility of dialogue. AMY GOODMAN: So he didn’t get arrested. ROBERT ELLSBERG: So he wasn’t involved in that, no. He was never arrested. AMY GOODMAN: But Dorothy Day, certainly. ROBERT ELLSBERG: Dorothy Day was arrested many times in her life. ROBERT ELLSBERG: Well, traditionally, popes spoke to their fellow Catholics. John XXIII in the early 1960s issued an encyclical on peace, where he said he wanted to address this to all men—as he would say at that time—of goodwill. And Pope Francis has followed that lead. He feels that his responsibility as leader of the Catholic Church is not just to lead his flock, but to be a moral voice speaking to everyone who shares this common home, the planet. And issues of poverty, of the environment, of violence, of condition of refugees and the poor, and inequality, he sees this as global human issues. And I think the connection with Dorothy Day and Thomas Merton is that these were both people who engaged with the world, but that was rooted very deeply in their kind of spiritual vision. He began referring to these people as—Lincoln and King, as well—as saying these are people who help us see reality in a new way. And I think that was the message that he was trying to share, a politics that’s rooted in seeing in a new way, in which we see each other as brothers and sisters, and children of one God, and not as opposed to each other. ROBERT ELLSBERG: Those could have also been words from Pope Francis, when he said in his recent apostolic exhortation, “When we say, 'Thou shall not kill,' we also have to talk an economy that kills,” and talking about a culture of indifference, that makes it impossible for us even to feel or see the suffering of others. AMY GOODMAN: Well, Robert Ellsberg, I want to thank you very much for being with us. She is on her way to sainthood? ROBERT ELLSBERG: I hope it will be soon. AMY GOODMAN: In the first phase? ROBERT ELLSBERG: Yes, yes. She’s—I think this support from the pope will help to move things along. AMY GOODMAN: Thank you so much. Robert Ellsberg edited and published selected writings by Dorothy Day, as well as her diaries and letters, and has published books on Thomas Merton. Ellsberg is the publisher of Orbis Books, the American imprint of the Maryknoll order. And if you’re wondering about that last name, yes, he is Daniel Ellsberg’s son. This is Democracy Now! When we come back, climate change. We’re joined by Kumi Naidoo, head of Greenpeace International. Stay with us. AMY GOODMAN: Music by Podington Bear, and for our radio audience and for our TV audience, we were just showing live images of the pope at the United Nations as he sits and is—next to him is the U.N. secretary-general, Ban Ki-moon. You can go to democracynow.org to see those live images; as we broadcast this show, he is about to address the U.N. General Assembly. This is Democracy Now!, democracynow.org, The War and Peace Report. I’m Amy Goodman, with Juan González.